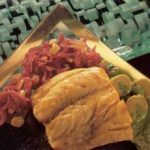 Red snapper is not a Venetian fish, but you are unlikely to find sea bream, a variety the Venetians might use for a recipe like this. Besides, like the reveler who dons a fanciful mask and becomes Venetian for Carnevale, red snapper takes on a Venetian accent when it is dressed in a seductively sweet-sour mixture of onions, raisins, and pignoli akin to the classic preparation “in saor.” “The important thing is for the fish to be fresh,” Francesco cautions. Buy a whole red snapper and have the fish market split and bone it. 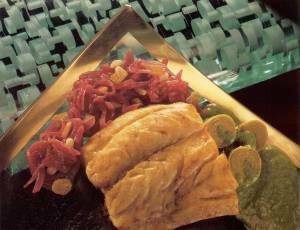 Black Sea bass can be substituted for the red snapper. Arrange the fillets skin side down on a broiling pan and brush with 1 tablespoon of the olive oil. Heat 2 tablespoons (30 ml) of the oil in a large, heavy skillet. Add the onions and saute over medium heat until soft but not brown. Stir in the vinegar and red wine. Broil the red snapper until lightly browned, about 6 minutes, do not turn it. Reheat the onions and mix in the sugar, pinoli, raisins, and orange zest.